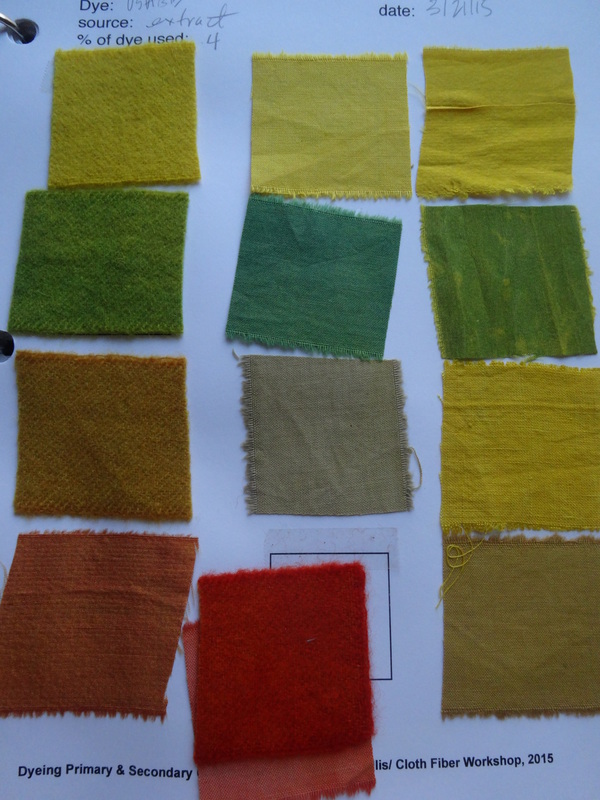 Last week I took an intense 3-day workshop with Catharine Ellis on natural dyeing. Just Look. 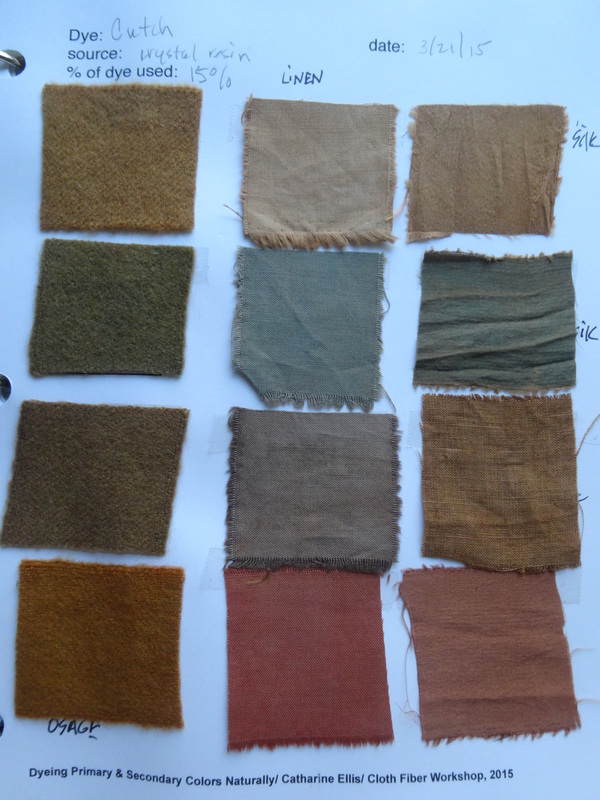 The samples are arranged by fibers–first column is wool, second is cotton, and third is silk. 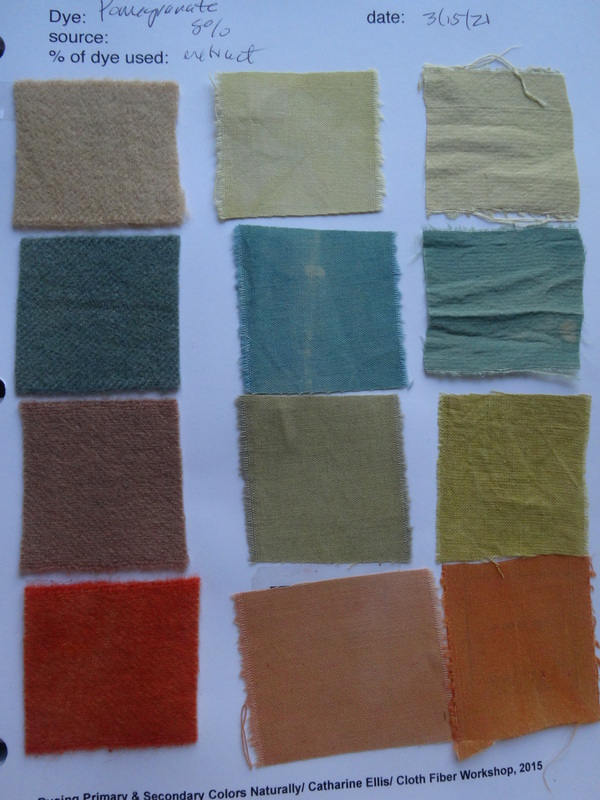 The first row on each sheet is simply the fiber dyed in the color. 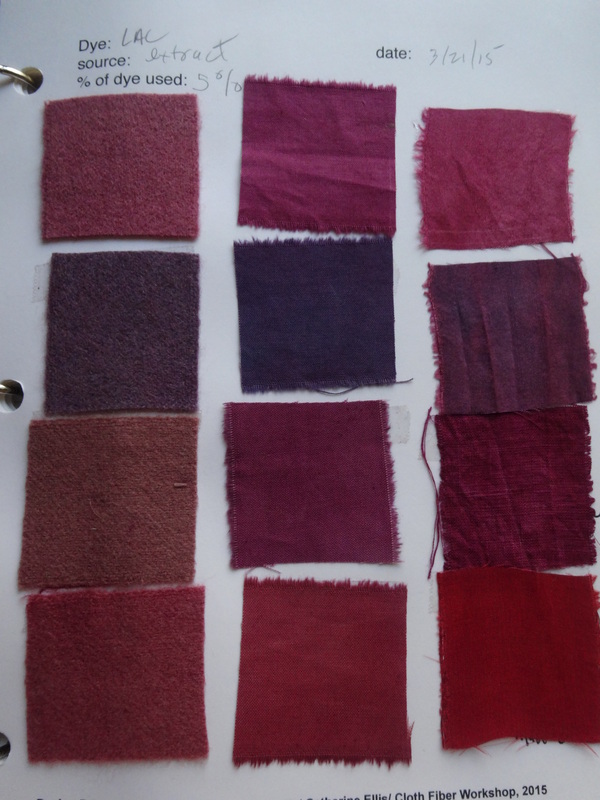 The second row is the fiber first dyed in indigo and them overdyed with each color. 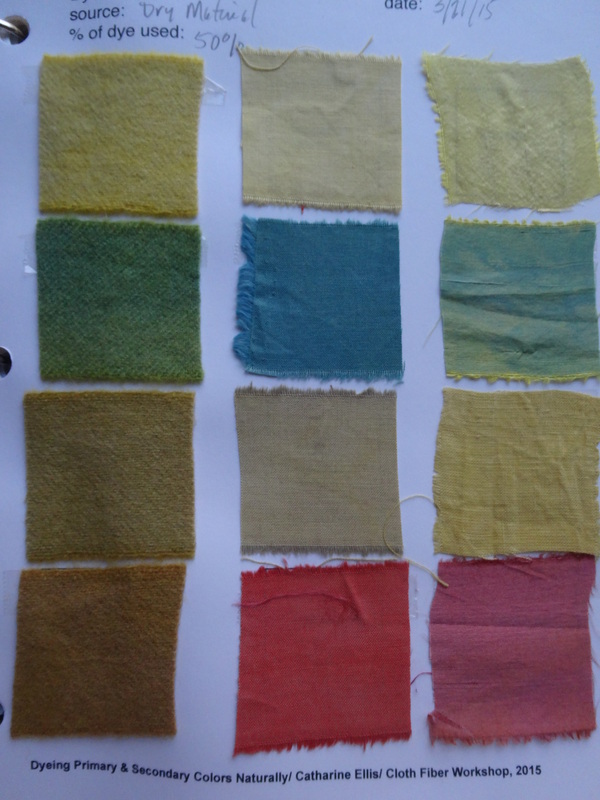 The third row shows what a teeny bit of iron does to the original color–and the last row is experimental. 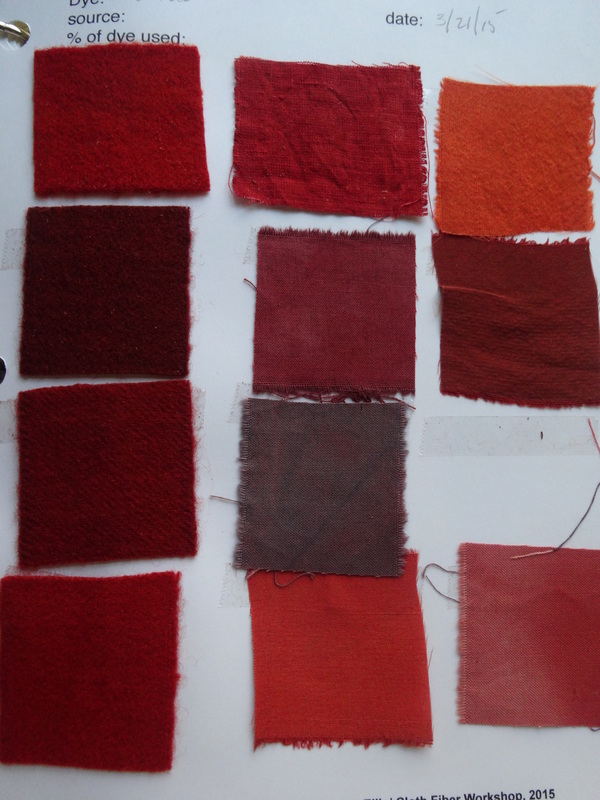 The dye sources we used were osage, cutch, lac, pomegranate, weld, madder and indigo. So I’m sitting here 3 days later still reeling from the amount of information–technical and otherwise–that we were exposed to. And following directions, being methodical, documenting process and result–well, those are not my strong suits. I rarely follow a recipe. Most times when I begin something, I do so because I have to–not because I really know where it’s going. And now I know why I’ve never been able to liven up my dye palette. It’s simple. I wasn’t doing it right. And then there’s this. 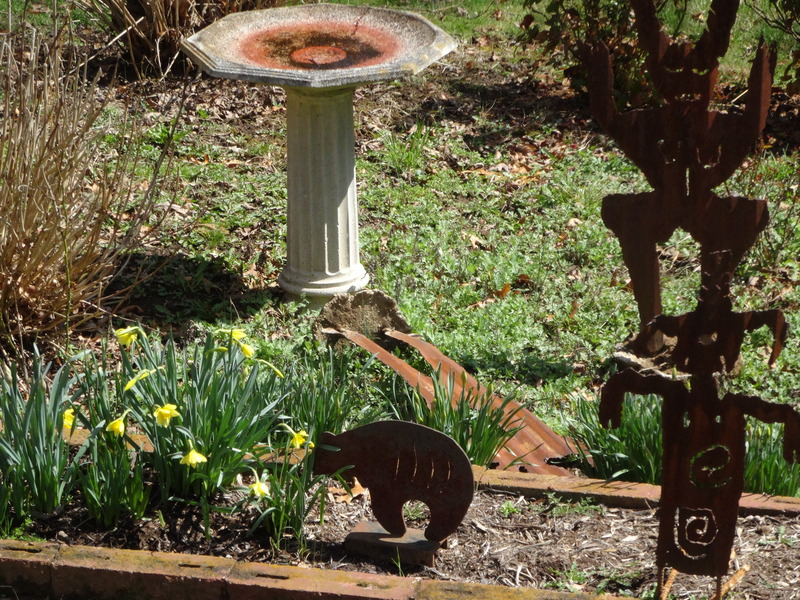 It’s spring here. We’re able to see what vegetation/plants await our appreciation since having moved in in the winter, we had no idea. Lots of–well, landscaping specimens. Shrubs and bulbs. And yes, of course, I’m glad to see them. But there will not be a regular garden here, I don’t think. At least certainly not this year. Containers probably. Too many deer. Plain and simple. Still, we had to cut down a tree in the front yard–an ornamental pear tree badly damaged. Part of it had already fallen on the roof and did a bit of damage. And because it was so close to the house and rotten in the crotch (unfortunate wording perhaps) it came down. So now in the yard we have a very large circular mulchy area free of the surrounding bermuda grass. And it’s going to become a dyer’s garden. Yesterday I ordered seed from a place in Maine–Fedco–and hopeful that deer won’t like the dye plants. Marigold I know will be safe. ← Momentum. Inertia. Resistance. Change. 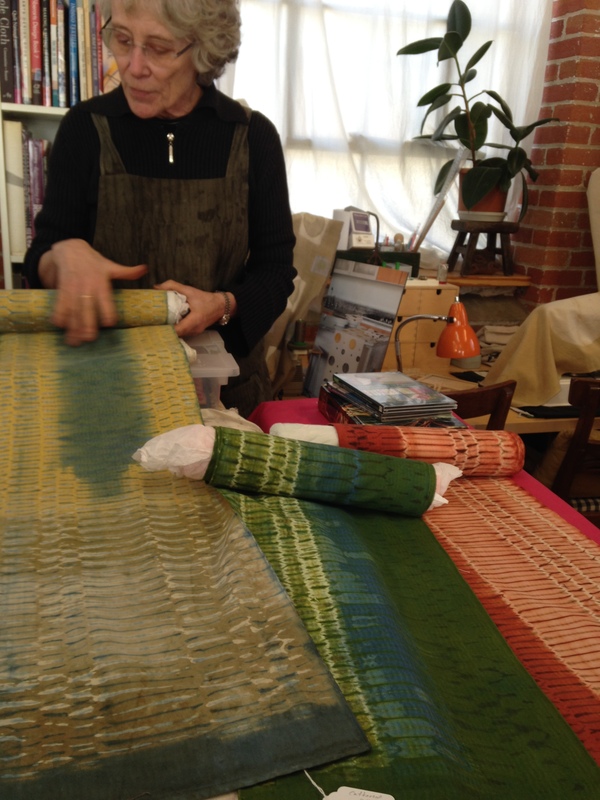 Patricia, What wonderful colors…great workshop. I’d forgotten that you moved but after seeing the photos am excited for what you’ll find in your neighborhood as Mother Nature produces new growth. I live in the country and a few years ago, using only a little over a dozen wild things, produced over 100 colors…it was a dyers bliss ! I wish you the same joy of it all. hey Judith. 100 colors! that’s amazing. yes, this is a first is years–not knowing what is about to pop up–from the earth and otherwise. i too have played just a bit with vegetation/flowers from my surrounds but never able to get the intensity of color i was after. or if i did manage intensity, it quickly faded. so i’m glad to have a different set of tools now. me too. and the light in these pics really didn’t do justice to the color. i’m partial to cotton but totally blown away with the silk and wool. What great colors! I’m especially struck by the redness of your madder samples. Did you add calcium to the bath and what was the temperature? It is so easy to make madder turn brown. I’m also very curious about the experimental lines. Where did the extracts come from? Questions, questions. I’m so glad you got so much out of the class. I’m also glad you are getting acquainted with your new property. How fascinating! A dye garden will be a new adventure. the madder was “matter” and had to be blended for quite a while. during the workshop each team was responsible for one color–my partner and i worked with cutch but i watched the madder process. ousr instructor emphasized heating it slowly and not getting it to hot. with cutch it didn’t seem to matter nearly as much. i don’t recall if calcium was added but just reviewed the handouts and they say “if water is soft add a small amount of calcium carbonate (chalk). Slowly bring temp to 150 degrees–this should take about an hour and then maintain for 1 hour. overheating madder will result in browner tones.” hope that helps. Thanks for this corroboration of what I have learned. Long, low temps for madder keep the brown at bay. I have had good results with a quick spike to 180 degress at the very end of the process, with immediate removal from heat thereafter. Also, I use Tums in the water when I want red. Cutch is much more forgiving. I AM SITTING HERE READING THIS WHILE YOUR EATING LUNCH WITH ELIZABETH! THESE COLORS ARE FABULOUS AND THE PROCESS SEEMS LIKE IT WOULD BE FUN! YOUR GIFTS NEVER END!!! YOUR ONE GIFTED ARTIST AND I AM SO PROUD OF ALL THAT YOU ARE AND DO! totally impressed with the red you were able to extract from the madder! i’ve ordered seeds to start some plants but it will take 5 years before the roots are ready to harvest! clearly i’ll have to find another source. Mmmmmm LOVE the magentas and the reds !!! yes–truly beautiful. and i wish the lighting had been better. the cutch was absolutely rich. So much for Rit…..xxoo love what you are doing! 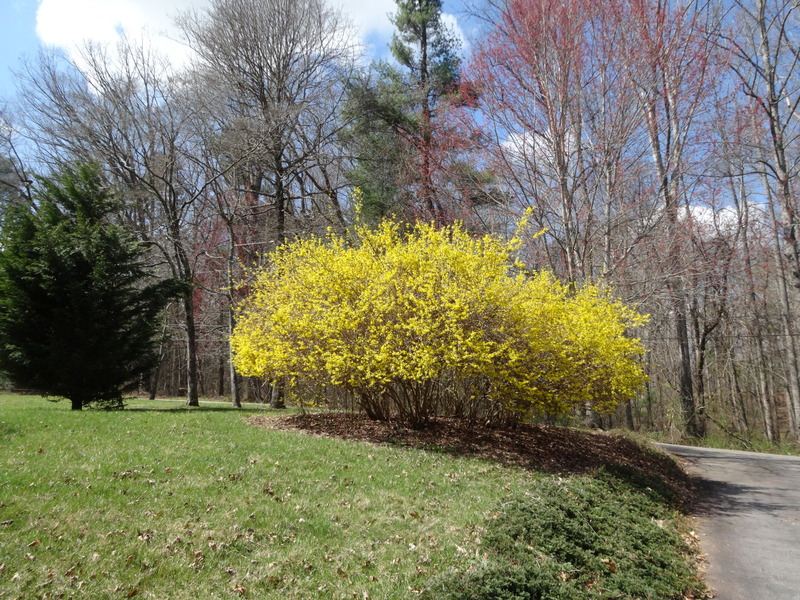 And that forsythia is amazing! Lucky you! when i started looking into the “fabric dyeing” industry i was totally bummer with what i read. incredibly toxic byproducts that more than likely are dumped into the water. When dying, I wing it with no prep or regard, just the ever-present “I wonder what this will look like?” My results have confirmed that indeed I lack talent, time, patience and organization to be a fine dyer. Love you sample sheet as is. They’re beautiful and would nice framed as is! Love the views of your new place! this sounds like me–“let’s see what will happen with this.” i know Marti gets amazing results with this intuitive approach, but not me. and i’ve noticed a few pieces are really fading. so i’m hoping to have color that will last at least as long as i need to look at it. I am swooning, too. Did the 1-2-3 method at the Sea Island Indigo workshop I attended last fall… it made me a believer too. Right now I have a block of frozen indigo in the back yard (!!!) Good luck with this — it all seems well timed with what you are creating… and PS those intervals of white are to-die for!! you won’t believe this–the white intervals aren’t happening now. Hmmm. Not polyester then? Had the rope been wrapped in a way that compressed the fibers at intervals perhaps? it was a different rope manufacturer. i’ve been trying out lots of different 7/32 and 6/32″ rope. just figured out which one that was and i think i can get it at the local ACE hardware store. will find out tomorrow. Good luck. That’s one of the challenges of dyeing (one that’s not in my wheelhouse) : keeping track of all those variables. it, the record keeping, etc etc and how i just don’t seem to be able to DO IT myself…. eeeek the record keeping. i have to remember to do it first of all–but then i see how helpful it can be. this is all so interesting and i think perhaps part of the lesson here is stepping outside my comfort zone–moving forward/backward in a way that is totally alien–almost uncomfortable. shaking things up a bit. that always seems to be a good thing. we’ll see where the pieces settle.